The skin is the largest organ of the body. It gets its strength and nourishment from the underlying dermis, a dense irregular connective tissue (previously seen in the Connective Tissues Lab ). It is protected by an outer covering of epidermis, a keratinized stratified squamous epithelial tissue. Numerous accessory organs are associated with it, notably sweat glands, hair follicles, sebaceous glands, and nerve endings. Note that all but the nerve endings originate from the epithelial layer. We will spend considerable time studying a single slide to understand the structure and functioning of the features of this crucial barrier between the external environment and our vital inner organs. 1. 100x view showing the overall relationships of the epidermis, dermis and accessory structures as listed below. 3. 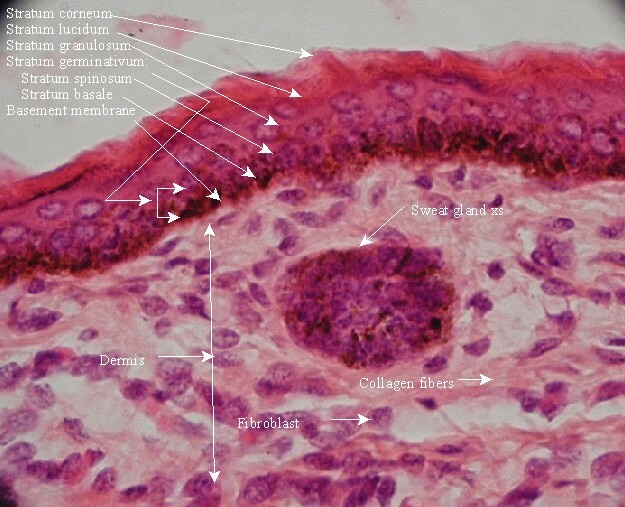 400x view of the epidermis , labeling its various layers, according to the list in the right column. Contrast with the mucous membrane of the esophagus, a non-keratinized stratified squamous epithelium which you studied as part of the Epithelial Tissues Lab (slide #5). 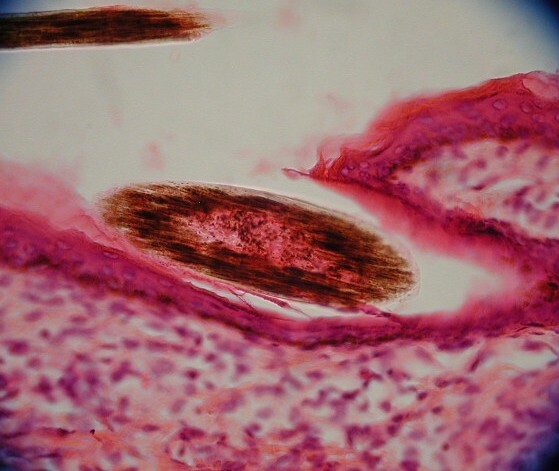 Non-keratinized stratified squamous has nuclei all the way to the apical surface. 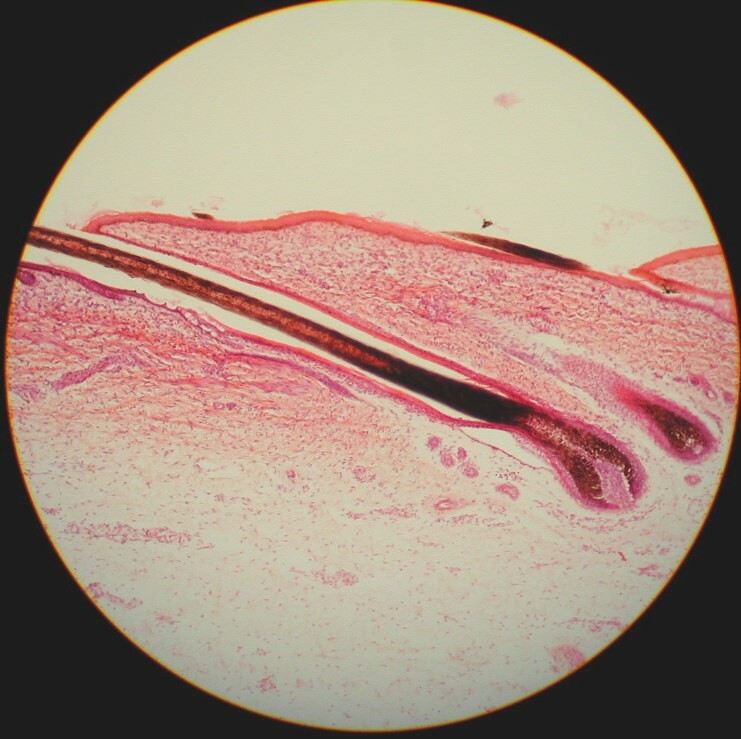 Note that the epithelial lining of the hair follicle is continuous with the epidermis. Nourishment for the growing hair is derived from a dermal projection into the hair bulb called the papilla. The epithelial cells which produce a hair are the matrix. Another accessory organ of the integument associated with the hair follicle is the sebaceous gland. This holocrine produces sebum, an oil which conditions the hair and skin, and whose fatty acids restrict bacterial growth on the epidermis. Here is a labeled hair follicle, etc . The cortex consists of tough consolidated “scales” of keratin. The medulla is less densely organized, and is hollow in some species, adding to insulating quality of the hair (polar bear). Here is a labeled view of the epidermis at 1000x. 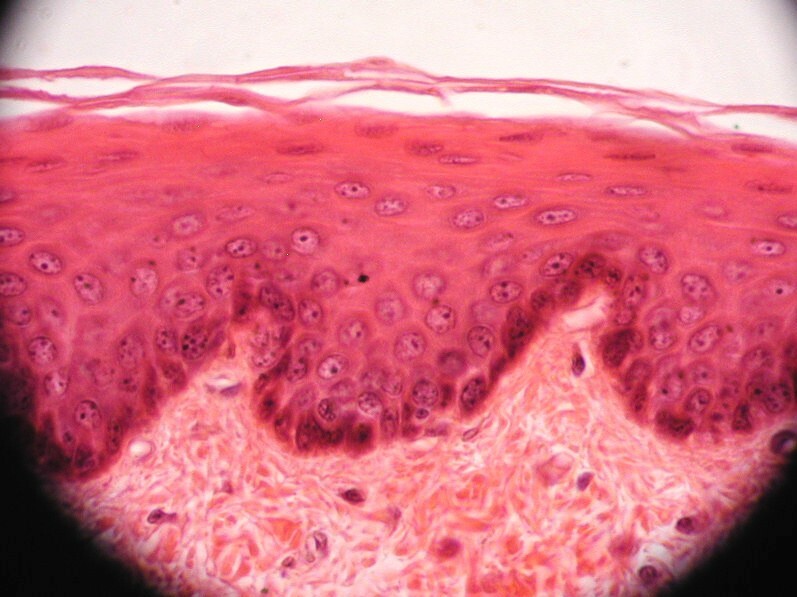 Epidermis is a keratinized stratified squamous epithelium which affords protection from a harsh environment primarily due to the keratin of which the outer stratum corneum is composed. “Invented” by reptiles, a coat of keratin freed them from the dependence on aquatic environment because it prevents dehydration in the air. Its indigestibility also resists microbial growth. Nourishment of the avascular edpidermis is through the well vascularized papillary layer of the dermis. 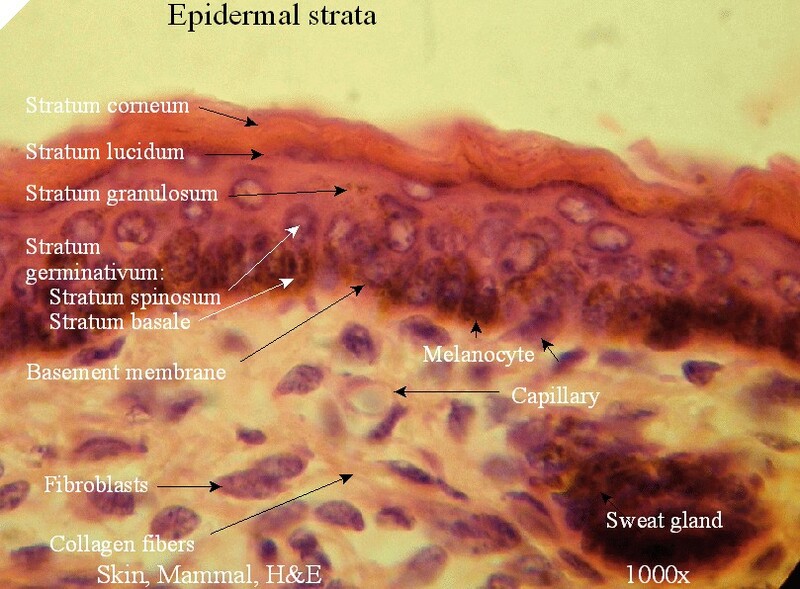 The epidermis from pig ear image demonstrates the flaking nature of the stratum corneum.